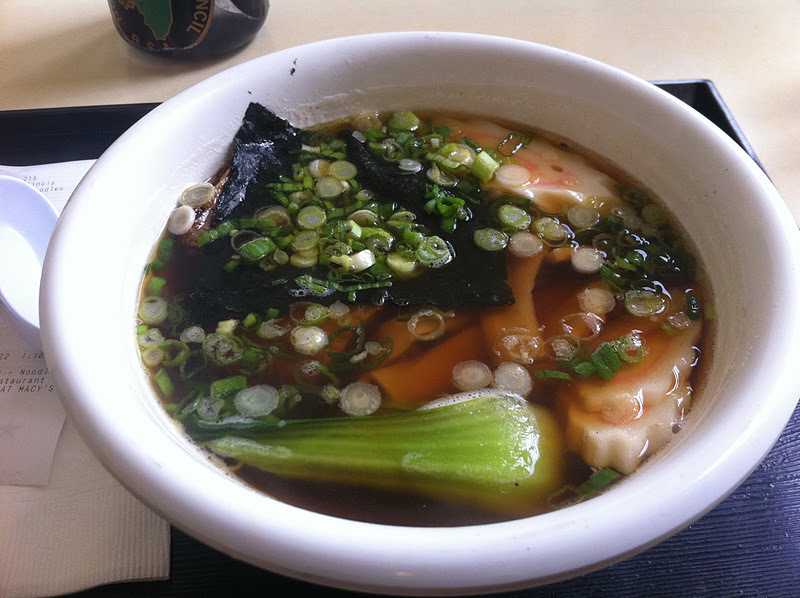 We're always looking for decent sit down lunch spots to take new team members or celebrate a birthday. My suggestion the other week was State & Lake, a place I had not been to in over a year but remember good things. I'm glad we went because the place is still more charming than an ordinary hotel restaurant and serves good food. The menu is what you expect for a business or tourist crowd - starters, salads, burgers and sandwiches (and a full bar). The burger looked great but I was in the mood for something different and chose the Smoked Turkey Panini (with Jalapeno, Bacon, Havarti, Avacado, Creme Fraiche). It's quite large with many layers of turkey. I enjoyed all the toppings, especially the jalapeno and avocado. Jared even gave me a sample of his turkey burger and it tasted great. All sandwiches come with fries or side salad. With most selections in the $12-15 it's certainly not a fast and cheap lunch but as far as sit down options go it's quite reasonable. With a small and interesting interior the setting is great for a lunch that fits between casual and power lunch. The food is good and the menu interesting with many options. 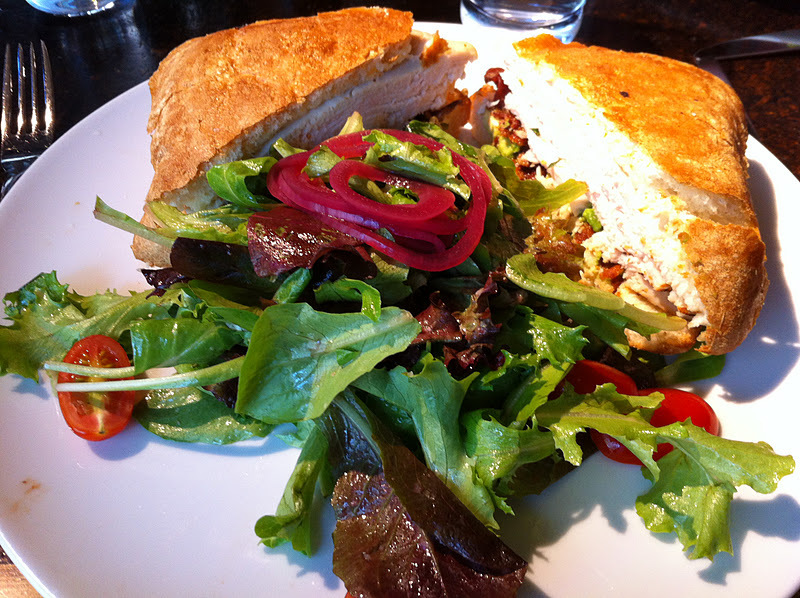 State & Lake has earned a spot as a regular option for casual sit-down lunches. What a crazy but interesting space. The last restaurant I remember in the extremely large and sectioned area was De La Costa. I have no idea if anything has been there since. People have written about the three faces/sections of Quay - the front bar, the middle dining room and the back lounge. I liked the vibe of the bar with lots of TVs, nice bench seating and plenty of high tops. The entire place is well designed with funky and new age style. This is especially true in the rather small dining room. We went on a Monday night so I'm not surprised it wasn't packed, but I an also imagine that it might get a little loud and cramped if all the tables were occupied. I really like the menu - it's approachable, to the point and affordable. Many of the items focus or feature seafood but there's a good balance of meat and vegetable selections too (lots of bacon usage). The four of us all had different tastes that night so we were able to see and try many things. We started the meal with two flat breads (one mushroom and one tarte flambe), tuna tartare and the surf and turf trio of sliders. 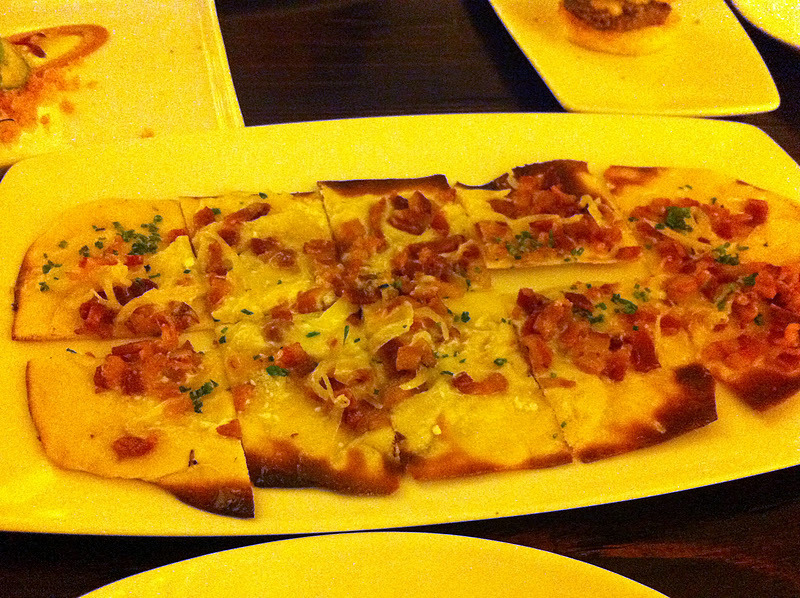 The flat breads were nice and the appropriate size for a starter. I actually liked the mushroom and goat cheese more than my flambe (i.e. bacon and fromage blanc). 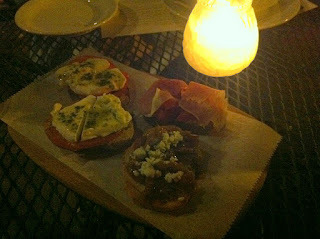 Our trio of sliders were ok but not amazing. the lobster roll wasn't bad and I liked the burger but not a huge fan of the short rib. 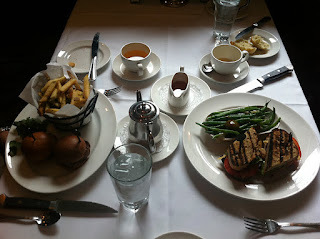 I had the fortunate pleasure to be invited to try Capital Grille's $15 three course lunch menu. The last and only time I've been to Capital Grille was to sample their "Generous Pour" event in the summer. It was a great event and a great meal so getting another chance to have a free meal of great steak is one I can't pass up. The "Plates" menu features 3 courses: Soup/Salad (Porcini Bisque | Clam Chowder | Field Greens), Sandwich (Mini Tenderloin (2) | Lobster Roll | “Knife and Fork” BLT) and a Side (Seasonal Vegetable | Truffle Fries | Roasted Butternut Squash with Cranberry Chutney). It's a lot of food, high quality and for $15 a tremendous deal. Most people think of a steak house lunch as only for high powered suits that can afford hours off and bottles of wine. If that's what you want you can still get that, but for $15 you get the same great food and lightning fast service because the staff at Capital Grille understand the value of your time in the middle of the day. I didn't know if I already wrote about Big Star but it doesn't matter. Now that I live in the area it's worth revisiting because now I can appreciate it from a different light - a place to go to whenever possible (especially in good weather). The last time we were there was likely the last great weather weekend in Chicago until next April. It was an impromptu decision but with guests visiting and a glorious sunny Sunday, why not spend an hour eating tacos and drinking margaritas before the work week reality sets in? We did just that, ordered a pitcher, some chips and guac, queso fundido and a few tacos. It's a standard selection and we held back since everyone was just arriving after brunch (!). As expected everything was great. We held back on the margs only because it was 1pm on a sunday with more productive hours left in the day. 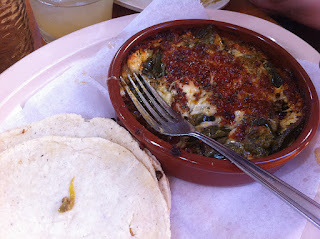 The al pastor taco was good and one of my favorites but I really loved the queso. There's a great spice/kick to the dish and is amazing. Melted cheese with peppers on tortillas is hard to beat. The guacamole had a little too much lime for my preference but we ate it so fast my picture is of a mostly consumed plate of chips. Last week was tough to find time to update the blog. Oh well, I hope to do better this week. I didn't realize until I started writing that my previous post was also a French restaurant (Paris Club) although the two could not be more different. Eric and I went on a Monday to enjoy the daily special of three course meal for $27. It's a great deal but since the menu is very reasonably priced it ends up equaling a free dessert. Even though there was a special menu provided, it appeared that every item is available to create your prix fixe. I loved the simplicity of the menu with eight options to start, six choices for entrees and four for dessert. There's enough of a mix of salads and classic french starters for everyone to be happy. 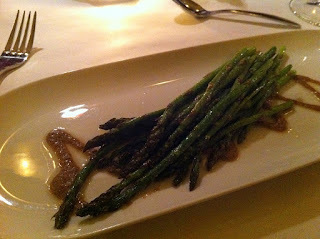 I went with the Asparagus salad with black truffle vinaigrette. 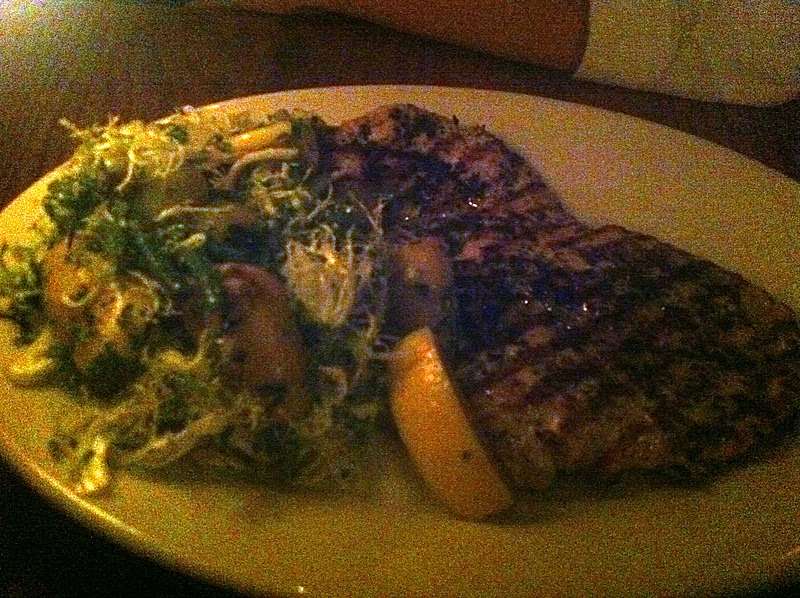 It was delicious and the truffle vinaigrette was subtle and flavorful. The last and only time I ate at Paris Club was during their soft open pre launch. We were able to sample a few menu items but not everything was available. This time we were coming in for a late dinner/snack after attending an event in the area. The most obvious aspect to Paris Club is that it is a place to be and be seen. the vibe is electric and everyone there is having a good and loud time. For even more fun (and exclusivity) there's Studio Paris upstairs. I've never been but I'm sure it's one of the hottest places to party in the city especially when the roof is open. But we sat down in the bar area for food and ordered a salad, chicken and salmon dish. It's not the largest sample size but plenty of food for our needs. We were in search of a solid neighborhood Italian restaurant and found a few options but settled on Enoteca Roma. I'm glad we did because it is top notch good food with a great vibe and a solid menu. The back patio is quite large, even though there is also a front patio. Now that I think about it, there is probably more seating outside than inside - and that includes the connected Letizia's Bakery (same owner). I understand why they had blankets on all the seats for customer use as the weather turns. But the large backyard patio with small candles and blankets is the perfect setting for a neighborhood Italian spot. We kept the meal simple and classic. There are more than a few bruschetta options and you can mix and match (they even split them in half to share). We ordered a Vinny (gorgonzola, caramelized onions), Emilia (tomato, garlic, basil, prosciutto) and two Napoli (Tomato, Baby Mozzarella, Pesto). All were good and I really liked the Vinny.